Parks' 10 Tots Aromatherapy Gift Sets make ideal gifts for friends and family alike. Each set is a hand-selected assortment of 10 of our most popular aromatherapy candles in a convenient, long-burning 'tot' size. You can burn the candles individually, of course, but they are designed to be used in 'bouquets', combining different fragrances and essential oils to evoke a specific aromatherapy effect as well as a complex and pleasing aroma. 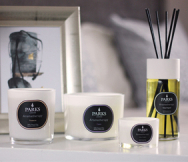 The Parks 10 Tot Aromatherapy Gift Set Number 3 contains 10 of our favourite scents in individual 'tot' votive mini vases. Each candle burns for approximately eight continuous hours, using our premium smokeless wicks to produce a small, soot-free flame and an even dispersal of its own unique scent. The candles are all hand crafted by our team of expert candle makers. They start by blending a unique selection of premium waxes to form a gentle, unscented burning medium. Next, they add one or more 100% pure and natural essential oils, exotic resins or other botanically-derived scents, ensuring that each is distributed evenly and continuously throughout the candle itself. What that means for you (or your lucky giftee) is that these distinct, long-lasting yet delicate scents will fill the home with beautiful fragrances from first light until the last drop wax has melted. The 10 Tot Aromatherapy Gift Set Number 3 arrives in a presentation-quality gift box.